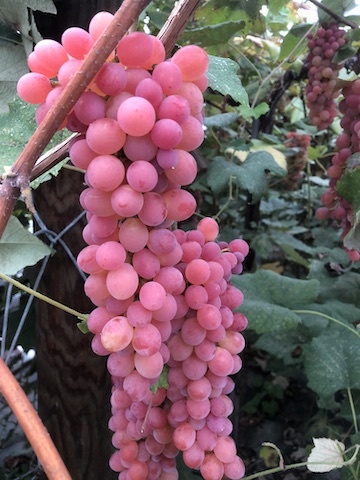 Our Vines - Table & Juice | Northeastern Vine Supply, Inc.
Hardy to around -20F. 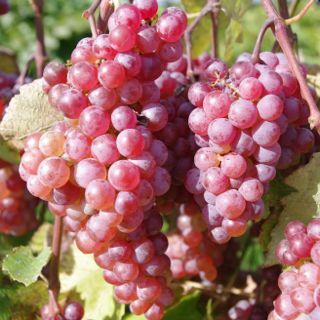 Very high quality seedless red grape with thin skin and good eating quality. Strawberry, non-foxy flavor. Can produce good yields on fertile soil in moderated sites. Good variety for greenhouse production. Selected by Vineland Station, ON. Hardy to near -30F and early ripening. Trailing growth habit and moderate vigor. Produces small to medium sized well filled clusters of pinkish red berries. Good texture, semi-adherent skin, strawberry-like flavor. A nice addition to the vineyard for fresh eating. Selected by Elmer Swenson. SOLD OUT FOR 2019. Bluebell was developed from the early 20th century University of Minnesota breeding program aimed at grape varieties for table use, plus juice, and jelly production. It is very cold hardy, early ripening, and disease resistant, but should not be planted on soils with pH above 7.0 where it would be prone to iron chlorosis. This blue, seeded table grape has a delightful, fruity, mild labrusca, or Concord-like flavor and thick skin. It produces a juice with delicate light red color that makes an attractive and unusual juice or jelly. SOLD OUR FOR 2019.